Al Baghdadi and Donald Trump are on Time Magazine's shortlist for Person of the Year. They are two peas in a pod in some ways -- one insists everyone practice his preferred brand of Islam, while the other finds any kind of Muslim entering the U.S. to be unacceptable. As for Person of the Year, since all Trump has done is talk about himself on the campaign trail, I'd give it to al Baghdadi, who has actually done something even if it's a negative: He's instilled fear in the heart of every Western Government and many civilians in his neck of the woods, which includes great swathes of Iraq, Syria, and soon to include Libya. He took on al Qaida and beat them to the Caliph punch, leaving them way behind in second place. 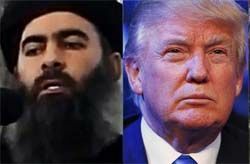 Al Baghdadi has also created a governing state in many provinces --Trump has no such governing experience.